This project is a mash up of my two favourite clock Instructables, A Word Clock and Literary Clock. I wanted to see if I could make an analog version of a word clock (without the fancy electronics) and it seemed appropriate that the word clock be house in a book. It also has paper gears made from the book's pages which rotate with the movement of the second hand of the clock. Analog clock: You can buy these at hobby stores, Ebay, you can also take them out of clocks you pick up at garage sales, dollar stores or thrift shops. The first part we need to tackle is to cut a hole in the book (pages) to house the clock mechanism. To begin we mark where in the book you will be cutting. Measure the depth of the clock, it will sit in the back of the book, so measure the number of pages from the back forward that you need to cover that depth and keep the book open to that page. I measured to find the centre of that page (both by width and height) and traced the clock mechanism shape around that centre. It is good to cut slightly larger than what you need, it doesn't need to be too snug. (I cut too small and had to keep hacking away at the hole to get it to fit -not fun). Using a utility knife or power tool if you have it and cut out the hole. Once that is done check to make sure the clock mechanism fits (and that hole is deep enough). Then remove the clock and paint some white glue along the sides of the pages to hold them together. I first placed something between the last page and the back cover so that I would still be able to open the back cover to replace the battery. PS: Save those page squares you cut out for Step 5. In order for the book to shut properly and have room for the clock hand, we will need to pull out some of the pages in the front. It is best to pull the pages away from the binding rather than tearing them, if you tug gently and do a few at a time they will come out quite easily. I left a couple pages just before the large hole in the back and cut out a small circle that fits around the shaft, I can then screw the hex nut on to secure it. Although we now have room for the shaft of the clock mechanism after pulling out those pages, there is a big gap and the front cover rests on the shaft of the clock mechanism. To fix this, I glued together the pages that were pulled out (glue along the edges - to hold them together), then cut off ~1-1.5 inch pieces to fit along the top and bottom of the book to use as spacers. Make sure there is enough room for the hour hand to fit in the centre. Glue those piece on and use a clamp to hold it in place as the glue dries. Now the front cover rests upon those spacers rather than the clock mechanism. The gears are made from the spare squares of book pages left when the hole from the clock mechanism was made. From those pages I cut out about fifty 1.5 inch diameter circles, fortunately I had a punch which made this task easy (now if only you could get a gear shaped punch). I divided the circles into two piles of 25 and glued the pages in each pile together into a stack with a glue stick. Then I cut out the gear shape using a craft knife. Mark the centre of each gear. The first gear will be attached to the the second hand of the clock. First remove the arms of the second hand so that your are just left with the pin. Sand the top of the pin with 80-100 grit sandpaper to rough up the surface for gluing and do the same to the top of the brass fastener. Glue the top of the brass fastener to the top of the pin. Once the glue is set, open the arms of the brass fastener and glue or tape to the paper gear, making sure that the pin is in the centre of the gear. Then trim off the part of the arms of the brass fastener that stick out beyond the edge of the gear with pliers. Drill a hole in the centre of the second gear large enough for a brass fastener to fit in loosely. Cut a small piece of drinking straw to compensate for the height difference between the two gears (depending how the first gear sits on the pin). Fit the brass fastener through the hole in the gear, add the bit of drinking straw and fold the arms of the fastener down. Trim off the parts if the fastener's arms that extend beyond the gear. Print out the template that I provided. I used paper that was similar in colour as the book pages. Cut out the circles and use them to trace two circles out of cardboard the same size. Glue the paper circles to the cardboard ones with a glue stick. Poke holes in the centre of each circle, the hour circle should fit around the lower shaft on the clock mechanism and the minute circle should fit around the smaller top shaft. It should be a snug fit, so that the circles turn with the shafts. To find the correct location for the two windows in the front cover, first marked where the shaft of the clock mechanism sits relative to the cover. To do this I rubbed some pencil lead on the end of the shaft and closed the cover tight. When you open the cover again you should see a pencil mark on the inside cover. Now line up the centre hole in the minute hand circle with the pencil mark and trace the top edge onto the inside cover (to find the top edge of the window). I used a compass to measure the distance between the minute hand hole and the bottom of the text and used this distance to draw a semicircle below the one you just made (to find the lower edge of the window). Determine the width of the window based on the width of the text. Repeat this process with the hour hand circle at the bottom of the inside cover. Now that we are sure of the exact spots to cut, we can begin. Use a small craft knife and slowly work your way through the book cover. As I've discovered, there are several different layers of cardboard making up a book cover, once you reach the fabric, stop, you may need to scrap off some of the last layer of cardboard from the fabric. I kept some of the fabric layer intact to wrap around to the inside of the hole, just cut the fabric like I did in the second image, wrap around and add a bit of glue to hold it in place.. The book is pretty plain without the dust cover, it needs a title. Being a word clock it should verbalize the time as though it would respond to you if you were to ask it the time. So I added "The Time Is" at the top to look like the title of the book. First I printed out the words, using the same font as the hours and minutes, taped it to the front cover and embossed the letters using a ball point pen that had run out of ink (I think you can get real emboss tools for this, but the pen works fine). Once that was done, I pealed off the paper with the words and painted the letters with gold paint. A fine tip brush or a paint pen and a steady hand is needed. Allow to dry. I thought the cover still needed a little something else so I made some arrows to point to the time. I sketched them out on paper, painted them gold and added a bit of shading. I then cut them out and glued them to the front of the book. You first need to drill a hole through the book cover for the pin on the first gear to reach the clock mechanism. The hole should be fairly large and not hinder the movement of the pin. Use the mark you made in Step 9 to determine the correct spot for the hole. 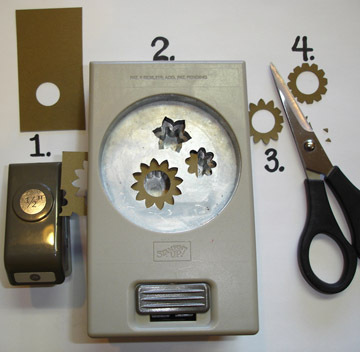 To place the first gear just place the pin in the clock mechanism through the hole in the cover. For the second gear, add some tape (I used duct tape) to the arms of the brass fastener, face down, and place on the book cover. You need to be pretty precise in your placement against the first gear for it to rotate. Another option is to drill another hole in the cover where the centre of the second gear should go and pass the brass fastener through the hold and fasten it on the inside cover with tape. I think it might be easier if you just use one of those " book boxes," and then cut out some styrofoam to fit the clock. I can't bring myself to test books apart, so I might try that. the "teeth" on this gear aren't long enough, but maybe a flower hole punch with longer petals would work? Congratulations Chrys! You always amaze me with your ingenuity and work! Hi, I'm trying to figure out if this would still work if I downsized the hours and minutes. I've done everything else, but I realized my book is too small to fit the pdf templates you provided. Thanks! Yes, it should still work fine if you scale down the templates. Planning on making this. I would love to find some real, maybe bronze colored gears to use instead of paper. Nice idea, it would look great with bronze gears. Yes,thank you I am totally thrilled! Thanks, and congratulations to you too on your beautiful lamp!